Since the 1960s, Pieter-Dirk Uys has been poking fun at South Africa’s past while finding hilarious ways to ensure it progresses positively. The satirist, performer, author and social activist was recognised for his ample contributions to the arts at the 19th annual ACT Awards. “As an organisation that prides itself on protecting the rights and copyright of artists, playwrights and authors, DALRO is proud to sponsor an award that bestows such a distinguished honour on South African artists who have spent their lives contributing to our nation's extensive cannon of theatrical work. It is through the work of such profound artists that South Africans can engage with a high calibre of artistry for generations to come,” says DALRO. Uys certainly is such an artist. Closely associated with both the Space Theatre in Cape Town and Johannesburg's Market Theatre during the 1970s and 1980s, he has written and performed 20 plays and over 30 revues and one-man shows throughout South Africa and abroad. 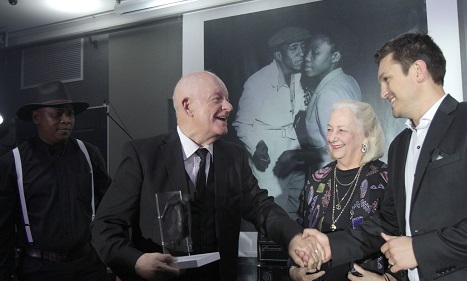 Over the years Uys, and his celebrated character Evita Bezuidenhout, have received a bevy of awards for both their theatrical work and their humanitarian efforts. Uys was awarded South Africa's prestigious Truth and Reconciliation Award in 2001. He has received honorary degrees from Rhodes University (D.Litt.Hon. 1997), the University of Cape Town (D.Litt.Hon. 2003), the University of the Western Cape (D.Edu.Hon. 2003) and the University of the Witwatersrand (D.Litt.Hon. 2004). While Bezuidenhout proudly received the Living Legacy 2000 Award in San Diego, USA. In 2011, Uys was honoured with a Lifetime Achievement Teddy Award at the Berlin International Film Festival, and in 2012 he received the FW de Klerk Goodwill Award. His plays Paradise is Closing Down, Panorama, God's Forgotten, Auditioning Angels, Faces in the Wall and Just Like Home have been performed internationally, and his one-man shows Adapt or Dye, One Man One Volt, You ANC Nothing Yet, Truth Omissions, Live from Boerassic Park, Dekaffirnated, Foreign Aids, Evita for President, and Elections & Erections have been presented in the United Kingdom, Denmark, Germany, Holland, Switzerland, Australia, the USA and Canada.